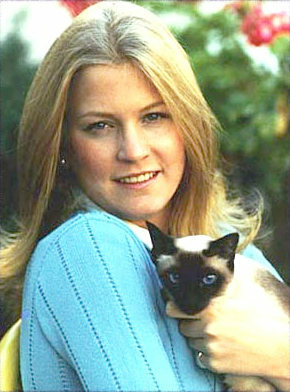 Susan Ford and her Siamese cat, Shan, Oct. 4, 1974. Photo from the Gerald R. Ford Library. When Susan Ford, President Gerald Ford’s teenage daughter, was in school for the day, her cat, Shan, would often hide under the bed in the Lincoln bedroom. Shan, a miniature seal point Siamese, slept in Susan’s bed at night and spent her days trying to avoid Liberty, the Ford’s gregarious golden retriever. Susan commented that Shan decidedly preferred women over men, but she added that the cat made an exception for the president, often rubbing against his legs and waiting for an opportunity to get into his lap. What Shan decidedly did not like, Susan explained, was being left behind. When the family went on a skiing trip to Vail, Colo., for example, Shan apparently wailed miserably while they were gone. To show her displeasure when they returned, Shan bit both Susan and first lady Betty Ford on their legs. The Fords had the cat declawed to prevent furniture (and people) scratching. President and Mrs. Ford gave Shan to Susan in 1973 as an Easter present, and the cat moved with the family from their home in Arlington, Va. to the White House when Ford became president in 1974. The cat, whose full name was Shan Shein, was named after a town the Fords visited in China.